In the last fifteen years Lara Vesta has been a lodge girl, barista, stable hand, telephone survey administrator, at home mother, university marketing and public relations coordinator, educational assistant, land use advocate, dog walker, apple farmer, and an Assistant Professor of English at Pacific University. In 2012 she published The Moon Divas Guidebook: Spirited Self-Care for Women in Transition and began offering ceremonies and education for women. In 2014 she launched Spirited Business Consulting, empowering healers, teachers and spiritual leaders to begin or transform their businesses. You can reach her at www.laravesta.com, or find more information about The Moon Divas Guidebook and classes at www.moondivasguidebook.com. 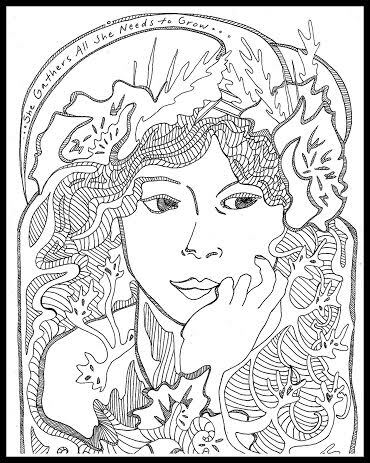 Wild Goddess compliments of Lara Vesta…print and add your colors!